Feeding: Care should be taken not to over feed this breed. They should always be supervised with toys and chews as they may choke on small objects. 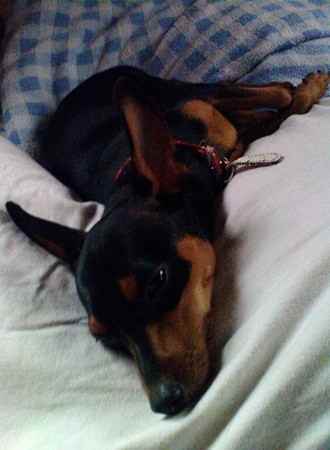 Temperament: The Miniature Pinscher is a proud, fearless, self-confident, spirited, headstrong and very demanding dog. Family Dog: Miniature Pinschers are generally good with other pets and children but some can become aggressive with other dogs. Shedding: The Miniature Pinscher is an average shedder. Grooming: The smooth, short coat of the Miniature Pinscher requires little grooming. They should be brushed with a firm bristle brush regularly and bathed only when necessary. Wiping the coat with a warm, damp washcloth can remove the loose hair. Training: The Miniature Pinscher is an intelligent dog that learns very quickly and loves to learn new commands and tricks. It is recommended to take this breed to a puppy class for socialization where they are able to interact with other dogs and people. Barking: The Miniature Pinscher loves to bark. Weather: Care should be taken to protect the Miniature Pinscher from the cold. Exercise: Miniature Pinschers should be taken for a daily walk. They can fulfill their exercise requirements with indoor play but as all breeds they have an instinct to walk that needs to be fulfilled. In good weather the Min Pin would love a good romp in a safe, fenced-in area. Living Conditions: The Miniature Pinscher makes a great apartment dog as they are very active indoors and can fulfill their daily exercise requirement without a yard. Appearance: The Miniature Pinscher has a small, compact muscular body that is sturdy and well-balanced covered in a smooth, sleek coat. The Miniature Pinscher is often referred to as the "King of the Toys." Size: The Miniature Pinscher is between 10 to 12½ inches tall with the body of males equaling its height and an average weight of 8 to 10 pounds. Females typically have a slightly longer body with a weight between 8 to 9 pounds. Companionship: The Miniature Pinscher is a very loyal and protective dog. Head: The head of a Miniature Pinscher should be proportionate to the body with a flat skull that tapers toward the muzzle. The foreface should balance with the skull and not be too prominent. Nose: The nose of a Miniature Pinscher should be black in color, with the exception of dogs with a chocolate colored coat dogs that may have a self-colored nose. Eyes: The Miniature Pinscher has full eyes, slightly oval in shape with a clear, bright appearance and dark in color. The eye rims should be black except for chocolate-coated dogs where the rims should be self-colored. Ears: The ears of a Miniature Pinscher are set high on the head and erect. They may be cropped or left uncropped. Muzzle: The muzzle of a Miniature Pinscher is strong and proportionate to the overall size of the dog's head. The top of the muzzle should be parallel to the top of the skull. Teeth/Bite: The Miniature Pinscher's teeth should meet in a scissors bite. Neck: The muscular neck of the Miniature Pinscher should be proportionate to the head and body, slightly arched blending nicely into shoulders. It should be free from any dewlap or throatiness. Body: The Miniature Pinscher has wedge-shaped, muscular and compact body with a well-developed forechest, short and strong loins, well-sprung ribs and a deep brisket extending to the elbows. The underline has a moderate amount of tuck up giving the dog a graceful appearance. The topline of the Miniature Pinscher is level or slopes slightly toward the rear. Forequarters: The Miniature Pinschers shoulders should be clean and sloping with sufficient angulation giving them a hackney-like action. The elbows should be close to the body. The Miniature Pinschers legs are strong, with good bone development. Their joints are small and clean. The Pasterns are strong and perpendicular. Hindquarters: The hindquarters of the Miniature Pinscher are wide and muscular giving the body its proper balance. When viewed from the rear, the legs are straight and parallel to each other with well defined stifles and short hocks. Gait: The Miniature Pinscher is known for its hackney-like action which is a high-stepping easy movement where the front leg moves straight forward and the foot bends at the wrist, similar to a horse's movement. Throughout the gait the feet face straight forward and both the front and rear sets of legs move in parallel with each other with the dog's drive coming smoothly from the rear with the head and tail carried high. Feet: The Miniature Pinscher has small, catlike feet with strong, tight, arched toes with deep pads. The nails are thick and blunt. The Miniature Pinscher's front dewclaws should be removed. Tail: The tail of a Miniature Pinscher docked in proportion to size of dog, set high on the rear and held erect. Color: The coat of a Miniature Pinscher can be solid clear red, stag red which is a red color with an intermingling of black hairs, black with rust-red markings and chocolate with rust-red markings. The marking on the black and chocolate-coated dogs are on the lips, lower jaw, cheeks, throat, chest, above the eyes, lower forelegs, lower hocks, inside the hind legs and the vent region and feet with black stripes on toes of the black-coated Pinschers and brown stripes on the toes of the chocolate-coated dogs. Coat: The Miniature Pinscher has a short, hard, smooth coat with a lustrous appearance. Life Expectancy: The Miniature Pinscher has an average life expectancy of 15 years or more. Characteristics: The Miniature Pinscher is a spirited and alert dog with high energy. They are very brave and intelligent dogs who believe they are a big dog in a little dog's body. Care should be taken not to spoil this breed as they may become a tyrant. The Miniature Pinscher makes a great watchdog and their other talents include competitive obedience and agility. Health: The Miniature Pinscher is a very healthy breed. History: Contrary to popular belief, the Miniature Pinscher is not related to the Doberman Pinscher. The Miniature Pinscher is actually an older breed than the Doberman. It was developed in Germany by the crossing of terrier breeds ('Pinscher' is German for 'terrier'), including the German Pinscher. It is believed that the Italian Greyhound may also have used to create the small size and high stepping movement. The Miniature Pinscher was originally used for hunting rats in the stables. Today, the Miniature Pinscher is bred as a companion dog.